The man who would become the second King of the united Italy was born HRH Prince Umberto Ranieri Carlo Emanuele Giovanni Maria Ferdinando Eugenio di Savoia on March 14, 1844 in Turin to HM King Victor Emanuel II and Queen Adelaide of Austria. It would be enough to judge him by the extent to which the ordinary Italian people loved him and how the radical leftists despised him, but the reasons for these positions reveal a man who was a committed constitutional monarch but who also saw that as no limitation to his desire to see the Kingdom of Italy achieve greatness. As a boy he was given the best education possible by some of the most respected scholars in Italy at the time. Yet, like all royals of the House of Savoy in those days, he was expected to have a military career and do his part to win greater glory for his dynasty and the Italian nation that was then still forming. Toward that end the young Prince Umberto served as a captain in the army of Piedmont-Sardinia (the highest rated amongst the Italian states) in the Italian Wars for Independence. Promotions followed and he fought at the battle of Solferino in 1859 and led a division at the battle of Custoza in 1866. 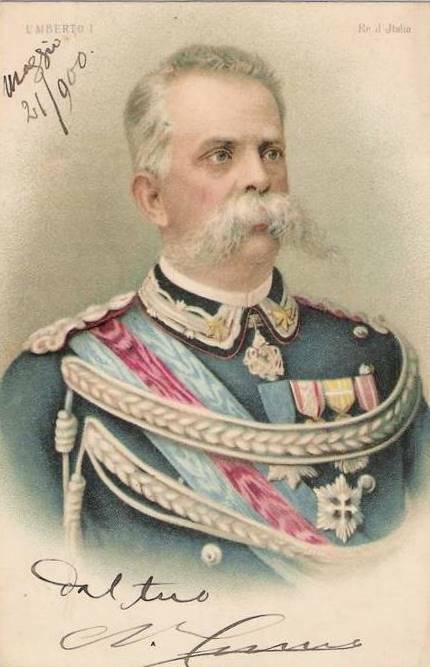 That engagement was a bitter blow for the Piedmontese, being defeated by a significantly smaller Austrian army, however, Prince Umberto acquitted himself well. Near Villafranca, he and his men were attacked by the Austrian cavalry (which was famous across Europe) and the Prince had his men form square and repelled every charge with the Prince himself remaining with his troops at all times, exposed to constant danger. In the aftermath of the battle, he helped to form the rear-guard, covering the retreat of the Piedmontese army and won numerous decorations for his courage and gallantry. Not long after, Prince Umberto, or rather his parents, began searching for a suitable wife for him, but this was not an easy process. The rulers of the princely states of Italy were not happy with the House of Savoy for leading the campaign for unification, nor were their Spanish, French or Austrian relatives. The conflict with the Pope, known as the “Roman Question”, also made other Catholic royal houses uneasy about a marital alliance with the heir to the Savoy throne. However, it would be wrong to conclude that the dynasty was being totally ‘blackballed’ as there were some princesses who were considered. An Austrian archduchess was set to be the chosen one but she burned to death in a rather horrible accident while trying to hide a forbidden cigarette she had been smoking. So, on April 21, 1868 Prince Umberto married his first cousin, Princess Margherita Teresa Giovanna of Savoy. The two had a very happy marriage and by the next year the princess gave birth to their first and only child, fortunately a boy, the future King Victor Emanuel III. Prince Umberto, like his father before him and his son after him, had it impressed upon him at an early age that his duty was to make Italy a great nation and to lead the Italian people to a place of prosperity and greatness befitting their glorious ancient history. The House of Savoy had embraced enemies, alienated friends and risked all in this one mission; to see the unification of Italy and to make the Italian nation a great and powerful kingdom. Prince Umberto would never forget this and his duty to his people and his country always came first. His father had succeeded in the first step, uniting the country and becoming the first King of Italy, and it would be up to Prince Umberto to carry on that legacy and take the nation his father had given him to greater heights. This was firmly in his mind when his father died and he became King Umberto I of Italy on January 9, 1878. Whereas his father had not changed his name when he became King, Umberto specifically chose to reign as King Umberto I rather than “King Umberto IV” using the older Savoy numbering. He did not want to appear as a Piedmontese monarch ruling Italy but as the first King Umberto of an Italian kingdom with a new Italian Royal Family. 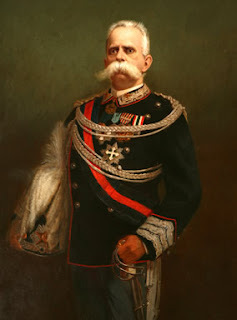 Also to further this ideal, as one of his first acts, King Umberto I undertook, along with his prime minister, a tour of the Italian peninsula. Despite the controversy associated with unification he was well received. Even in Naples, large crowds turned out to cheer for him. However, during a parade he was attacked by an anarchist. The King drew his sword and fended off the would-be assassin who was later sentenced to death. However, King Umberto commuted this to life at hard labor and the man later died in a mental hospital. This earned the King greater popularity as did his solemn commemoration of the death of Giuseppe Garibaldi in 1882. Garibaldi had been greatly romanticized and celebrated as a nationalist but he had fallen out with the royal house somewhat over his revolutionary republicanism. Nevertheless, the King gained a wider base of support for honoring the memory of the man who had played such a significant role in Italian history. King Umberto I became known as the “Good King” or “Umberto the Good” by the common people because of the care and concern he showed them. When Verona and Venice suffered massive flooding in 1882 the King went himself to direct the efforts to minimize the disaster and gave generously from his own funds to aid those displaced. When a massive earthquake struck Ischia the following year the King again intervened, ordering rescue operations to continue five days longer than planned which resulted in many lives being saved. Again, he went himself to lend a hand even though the area remained quite dangerous. He showed similar compassion in 1884 when a cholera epidemic struck southern Italy and by all of these and similar actions was beloved by the Italian people. In securing the dynasty and uniting the country, the reign of Umberto I was an early success. The only ones not satisfied were the radical leftists who opposed the rise to prominence of more conservative elements in government, the most notable being Francesco Crispi. In the area of foreign affairs, like Prime Minister Crispi, King Umberto favored colonial expansion and it was under his reign that the first foothold was made for what became the Italian colonial empire, eventually encompassing Eritrea, Somalia and (under his son) Libya and the Dodecanese Islands. 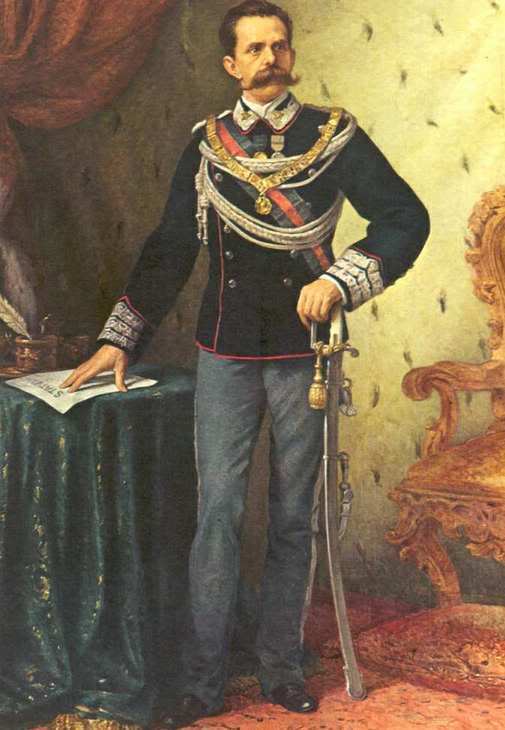 King Umberto took Italy into the Triple Alliance alongside Germany and Austria, which was met with skepticism by those who still regarded the Austrians as their natural enemies since the wars for independence. He visited Vienna and Berlin but was also careful to maintain the good relations the Savoy had long maintained with Great Britain. In fact, the King considered the Triple Alliance only half effective so long as Italy lacked a naval alliance with Great Britain. However, this string of foreign policy successes came to an end with the disastrous defeat of the Italian colonial army at Adowa, Ethiopia in 1896 in a war over a disagreement concerning a treaty that agreed to Ethiopia being an Italian protectorate. This led to opposition to the war and colonial expansion in general which was hyped by the radical socialists who had always opposed the drive toward empire anyway. In 1897 the King survived another assassination attempt, by another anarchist, near Rome. The following year came the one most controversial event of his reign. Riots, first over the price of bread but whipped up by leftist agitators, broke out in Milan and the city was placed under martial law. As the situation began to get out of control, General Fiorenzo Bava-Beccaris ordered his artillery to fire on the crowd, killing about a hundred people and wounding many more but putting an immediate stop to the rioting. Many were shocked by this and many people (mostly revolutionaries anyway) were outraged when King Umberto I decorated the general afterwards. This incident has been used to paint the King in a very negative light and it was an unfortunate incident undoubtedly. However, the King only recognized the general for taking decisive action to restore law and order and safeguard lives and property against the already violent crowd of rioters in the streets. It was not an award for butchery but for putting a swift end to an ugly situation that was threatening to become worse. The Socialist Party had been behind the outbreak of violence which included, incidentally, a young radical named Benito Mussolini. Nonetheless, if the King was unpopular with the radical leftists and socialists before, this incident made them absolutely despise him. However, this was not the only case by which many have misjudged the second King of Italy. Another was his policy of no-compromise regarding the “Roman Question” as the standoff with the Holy See was called. The King, in 1886, famously affirmed that Rome was the capitol of Italy and would always remain so and never return to clerical rule. King Umberto was, however, no anti-clerical and in the end the Church came to accept secular rule for the Eternal City. After the Italian army had occupied Rome in 1870 the Pope had been offered royal honors, sovereign status and rule over the whole of the Leonine City but this was rejected. Catholicism was always maintained as the state religion of Italy and, as we know, in the end an accommodation was reached to the satisfaction of the Holy See even though the territory on offer was reduced only to the Vatican. The King also became more and more religious throughout his life and was always charitable, though not many know it, as he helped others privately without any fuss or fanfare. In 1900, in what would be the last major foreign policy act of his reign, King Umberto dispatched Italian troops to China as part of the Eight Nation Alliance to suppress the Boxer Rebellion. The Kingdom of Italy would gain a concession in China as a result but Umberto I would never know this. On July 29, 1900 King “Umberto the Good” was driving in Monza when he was shot four times and killed by an Italian-American anarchist named Gaetano Bresci, an act of revenge, the man claimed for the suppression of the riot in Milan. The public mourned heavily for the King they remembered fondly for his good humor and generosity. On August 9, 1900 he was laid to rest in the Pantheon in Rome next to his father. H.M. had quite a mustache, eh? Yes -fierce facial hair -I love it. Each King had less though. VE2 had the long beard and moustache, U1 just the long moustache, VE3 just a small moustache and since U2 all have been clean shaven. Maybe there's a Samson effect going on. Having reda the before he went Italy of the activities of anarchist in the chief Italian cities ,Cheiro had for his own curiousity worked out the significance of the Fadic numbers and astrological events in relation to to King Hubert’s life. Keeping things in his mind Cheiro asked the King to let him examine the right hand.The narrow escape he had from assassin in 1987 ,when the miscreant Passevante attempted to kill him was clearly indicated. Cheiro was conscious that King Humbert was a brave man –that he wanted to know the truth. because of his his responsible position,and therefore Cheiro would it would be right to telling him all he could. As he stood examining his hands with their characteristic marks ,Cheiro saw as in a tabulaeu the sword of fate suspended over hisheda./ In a few months that lay between him and the fatal day stood out clearly before Cheiro’s occult consciousness .Cheiro dared to tel him all. King Humbert turn pale ,with draw his hand ,leaned back in the chair for a few seconds ,and shruggedhis shoulders. Then he relapsedintosilence.There wsa no sound but the tickling of a great clock .It seemed almost as if the moments of Time were running swiftly away for His Majesty of Italy. Cheiro and others discussed the fascinating question :can Fate be averted? 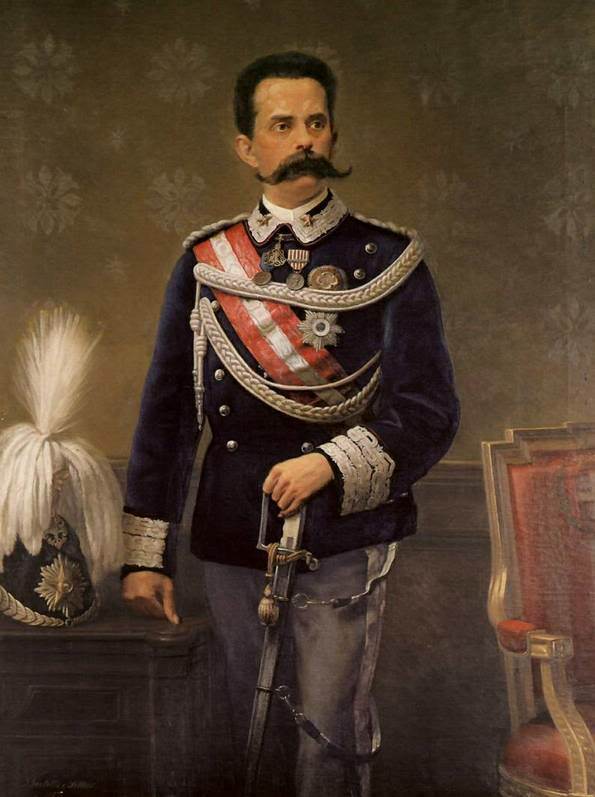 I have heard rumors that Umberto I had an illegitimate son with an Austrian servant girl in 1880. Does anyone else have any information on that? It is only known that Umberto had a mistress, the older Eugenia Litta, a high ranking Italian aristocrat. When 40 she had a son from him, Alfonso Litta, who died when 8 years old. The parents mourned him a lot. 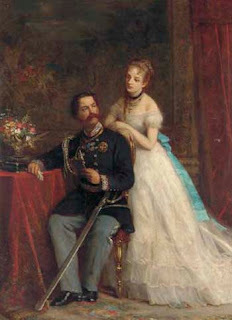 Queen Margarita, who was a good sport, allowed Marchioness Litta at Umberto's deathbed. Umberto had another mistress but no child was mentioned. What kind of hat is he wearing, specifically what is it called? A Note on New York "Marriage"
Monaco Has a New Princess!